Our neighbors told us about Phyllis when they knew we were thinking of selling. They couldn’t say enough about her and how much they trusted her. I would recommend Phyllis to ANYONE selling a house or buying a house in the Portland area. Every interaction we had with her was friendly, fast, professional, and productive. While she had a ton of experience and her negotiating skills were essential to our deal, she also let us trust our own instincts about our house and its value, which ended up being a benefit to us in the end. Thanks, Phyllis! Phyllis is the jam! My partner and I were looking from out of town and needed an affordable spot with plenty of storage and a workshop, not to mention we wanted yard space. Phyllis answered us promptly, answered all of our questions, went through countless searches for us, and helped us find a fabulous house in a chill neighborhood. My favorite part is that she never felt pushy, only informative and helpful. Nothing is more stressful when making a big purchase than someone egging you to buy. Thank you, Phyllis! I’d recommend you to anyone! Very professional, knew the right pricing, did what she said she would do, and got the house sold in a relatively short period of time. Pleasant to work with. Very helpful with all the details, helped with things technically outside the contractual relationship. 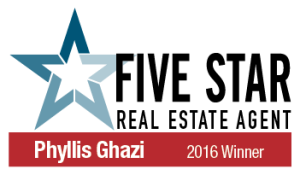 To speak of Phyllis Ghazi is to truly speak of a professional who takes pride in her work. A pride that is both above and beyond what is simple, banal, ordinary or common place. I’ve worked with innumerable agents in the past, at least six come to mind, and yet Phyllis far-and-away sets the benchmark of what an agent actually can and should be. Her mind is strategic, her skill-set is broad, and her knowledge quite vast. She is extremely trustworthy, stalwart and consistent. I began working with her after finding that she was the most responsive of a number of agents whom I contacted when beginning a relocation from thousands of miles away. Due to a busy schedule, I was not going to be able to make it into town prior to purchase, so Phyllis did a tremendous amount of leg-work and communication in order to help me come to an amenable deal on an inexpensive condo to hold whilst I became established with work and so forth in my new state. Her negation skills were spotless and we were able to get the price down by $11,000. To give you an idea, that was about 10% of the purchase price of this small yet amenable condo. We knew for several reasons that this condo might not be a fast or simple sell but Phyllis promised to be on-board to do so when the time came. She gave solid advice on remodeling to sell more quickly and we agreed to speak again in about a year. Flash-forward one year later, when I contacted Phyllis she truly hit the ground running and we had the condo on the market within a week. Next we had a buyer within a week and it is now that Phyllis’ acumen truly unfolds. Following the buyer’s interest we found our dream situation and put a bid on a lovely brand new town home with a number of perks. The condo buyer had a number of needs one of wish was a new washer/dryer hook-up. Phyllis put together a team and a strategy for installation including an excellent plumber, electrician and drywall solution and then, as can sometimes be the case, the buyer backed out. Our dream situation hung precariously in the balance. Firstly, the amount of leg work that Phyllis engaged in to satisfy our first buyer was extraordinary alone. What happened next was one part miracle and two parts skill. In less than 24 hours we got a call from another, only mildly interested party who also wanted a washer/dryer hook up in the unit. The road map that Phyllis had already put into place simply needed to be actualized; With great skill and ability, Phyllis came to architect a deal that gave this buyer incentive to act much more quickly and therefore saved our deal on our lovely town home. It happened so fast, exactly to plan, and it was truly amenable to all parties. Everything moved forward as if we had never lost a buyer at all and, irrespective of this currently fast paced market, we were able to keep the property with which we had truly fallen in love. Throughout the course of a year and half process from start to finish, Phyllis proved her mettle as one of the finest agents with whom I have ever worked. She is not only a gem but also a treasure. To work with her is to work with someone who truly gives it her all. She is tenacious, consistent, and trustworthy: an outstanding professional. I chose Phyllis to be my buyer’s agent after she was helpful a few month’s earlier on an unrelated real estate matter. I closed on a condo last week and Phyllis was there every step of the way to make the home purchase as smooth as possible. I’m extremely happy with Phyllis’s work and strongly recommend her. Where do we begin? As former “FSBO” folks, having sold more homes by owner than most families, we have always been reluctant to pay the high commission for work that we could do ourselves. However, in this economy and with our insanely busy schedules, we decided it was time to look for a compromise. We wanted to find someone that would promote the sale of our home, but not cost us an arm and a leg in the process. 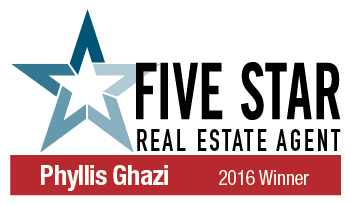 We interviewed several reduced fee agents, and decided on Phyllis Ghazi, a highly competent professional who was willing to list our home, market it aggressively and charge on a fee for service basis. While full service agents had cautioned us that reduced fee agents just wouldn’t get the job done, we couldn’t justify the full fee price. We decided to try Phyllis and the fee for service model. Guess what? IT WORKED!!!!! We sold our home and at a reasonable price. Phyllis is a highly competent, no nonsense professional who focused on the task and got it done! We HIGHLY recommend her!!! I moved to Portland from the Bay Area as my company was opening a new office. I knew little to nothing about the area, and Phyllis was extremely patient educating my wife and I on the subtle differences between the neighborhoods, East v West, public school districts with exceptional records, etc. My wife loves the house we call “home”, my children are prospering at the schools we chose, all due to Phyllis’s efforts. I have even gone a step further and purchased an investment property through Phyllis (www.creatusdev.com). We plan on listing the sale with Phyllis in July. If you are lookning for a flashy sales associate who will tell you what you want to hear, go elsewhere. If you want an honest, hard working individual who will help you find the best house for you and your family, at the best possible price, I fully endorse Phyllis. Phyllis Ghazi is very good at her job. She helped us to quickly sell our Portland house in a lousy market and helped us buy a smaller, more affordable place. In both transactions she was hard working, thoroughly professional, and – especially in finding a smaller place – immensely patient. We’re not easy people to please and, to make her job even harder, we had very little to spend. Phyllis was tireless. She showed us place after place after place until – much to our relief (and I’m sure to hers) – we finally found the one. We’ve recommended her to friends and relatives – for whom she’s done good work – and we’re happy to recommend her to you. Phyllis was very knowledgeable and professional to work with. We were able to negotiate a special contract with her and were quite appreciative of her flexibility. We sold our house in a short time, despite a sagging market, so she more than proved her expertise in all aspects of real estate. We found Phyllis while we were living across the country with plans to move to Portland upon the sale of our home. Although nobody knew how long it would take to sell our house in this economy, Phyllis nevertheless helped us with preliminary searches. Once we moved here we decided to rent for a year so we could learn the landscape, yet Phyllis stayed in touch and kept us apprised of real estate. For over one year, she provided us with very helpful service without knowing if she would be paid for her time. When we were finally ready to buy, she walked us through the entire process and was certainly a great advocate for our needs. We were too happy to refer her to my in-laws who moved here just recently. Because of her efforts, my in-laws only had to live with us for three weeks before we helped them move them into their own home. We appreciate her time spent both with us and with her preparations. Phyllis was fantastic to work with. I would recommend her to anyone that is looking to purchase any property. She is patient and truly has your best interests as her top priorty. We will use her again for our next purchase as well.